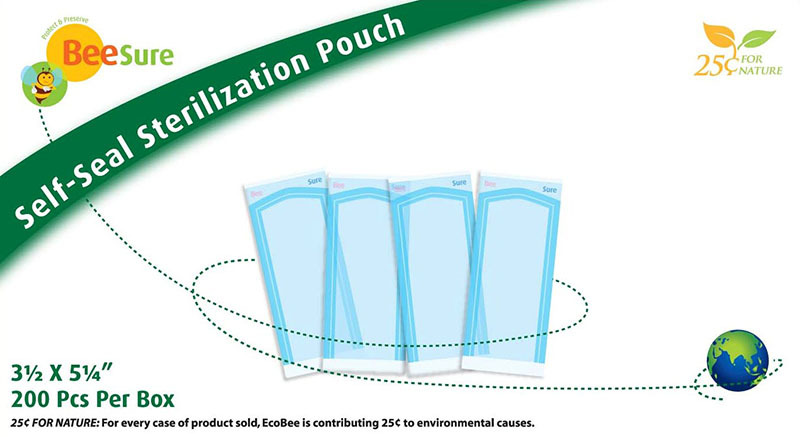 eeSure self-seal sterilization pouches incorporate blue tinted film that allows any compromises in the film's integrity to be more readily visible. The laminated film ensure consistently clean peeling and maintain the sterile integrity of the contents until pouch is opened. BeeSure self-seal sterilization pouches incorporate blue tinted film that allows any compromises in the film's integrity to be more readily visible. The laminated film ensure consistently clean peeling and maintain the sterile integrity of the contents until pouch is opened. Other features include Minimal printed area in and between the sealed layer of paper and film, triple sealed rails, a thumb notch, corner tack seals, and a wide self-seal adhesive strip with perforated fold. The pouches are printed with water-based, lead-free ink and are made with medical grade paper and solvent-free lamination adhesives. Four sizes are available packaged in quantities of 200 pouches per box, 10 boxes per case.